I don’t know if you’ve ever experienced a rock festival at the bottom of your garden? It’s years since I went to one, so Allah, in an obvious Mohammed-mountain parallel, decided to bring one to me. 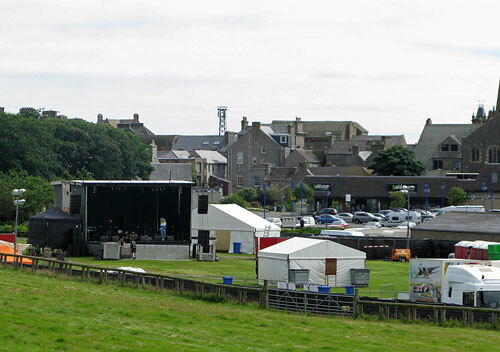 Wick hosted the B-fest festival this weekend, Friday night and all day Saturday, down by the river, just half a mile from our front door. It was like being shelled by the Mormon Tabernacle Choir’s heavy artillery division. By some oversight the sun was shining on Saturday, no need for anti-rickets medication this weekend, so we decided to slip away to recover our hearing and stare at some scenery. This involved a trip along the coast to Strathy Point, a little peninsula jutting out into the North Sea, an hour’s drive over the border into Sutherland. 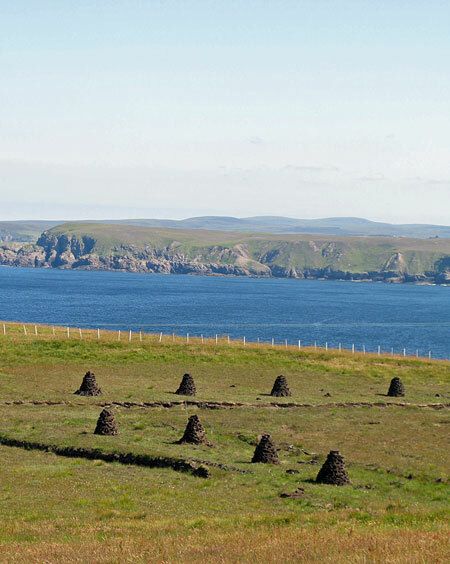 Strathy is a crofting township, scattered bungalows and ruined stone huts, and you can see a remnant of an ancient way of life in the pyramids of peat stacked out in the fields to dry like ancient stone cairns, contrasting strangely with the satellite dishes on the crofts themselves. It’s a mile or so’s walk from the car park to the lighthouse, downhill through a rocky defile filled with sheep who watch you as you pass with the silent menace of inner city gang members, except that sheep mostly chew grass instead of gum, and drug-related crime among them is comparatively low. We sat on the grass at the end of the point, the sun on our backs, the ground curving away below us like the bows of a submarine, and watched gannets diving for fish out past the rocks—the whole restless North Sea laid out before us, nothing between us and the distant curve of the far horizon but a few weathered slabs of rock. Driving home with the windows open, breathing the scent of freshly-mown hay, it felt like summer, or rather, the coming to an end of a summer we never had. In a month it will be autumn; and the year will start to wind down like a top running out of spin. Schools go back in Scotland next week—summer’s over already, sorry guys. Still, autumn is prime gansey weather. 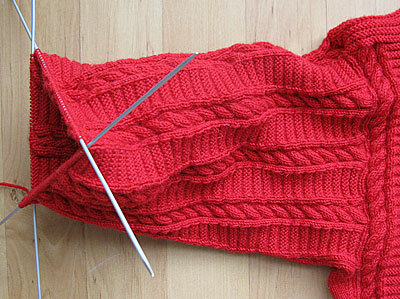 I’m sauntering down the sleeve, over half way now, taking my time and enjoying it. 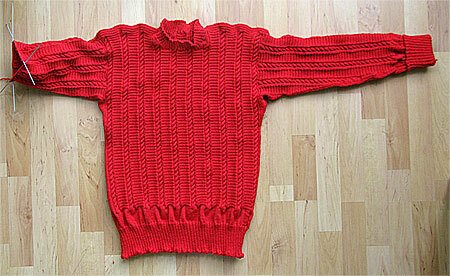 I reckon of my 13 balls of 100g Wendy wool I’ll have just under one ball left by the end. I hope my friend David, who the gansey’s for, has been keeping in shape. It feels as if it weighs as much as a deep-sea diver’s suit—he’ll think gravity’s been increased once he tries it on. Thanks to everyone who downloaded copies of my novel The Bone Fire when it was on free promotion last week. Remember, if you should happen to read it—and enjoy it—a review on Amazon would mean a lot, and help the book enormously next time it’s on a promotion. 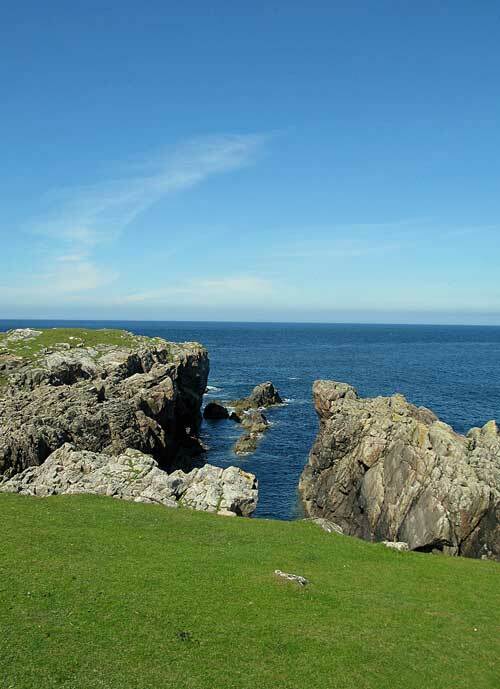 I love the photos of Strathy Point. I could set up a tent and live there forever. The gansey looks great! The weight of it will keep your friend warm and dry on the worst of days. Have a nice vacation. Where are you going? Well, if it’s anything like today I think you’d need a tent with a tether, the wind’s so strong! I’m going to advise my friend to wear his gansey sitting down. Margaret is off to Worcestershire doing her Piper At the Gates of Dawn impression, on a music summer school, while i stay home and do some writing, and general malingering (it’s important to have a goal in life—and then ignore it!). It’s a good thing I’m reading this at 2 AM; the neighbors have gone to bed, so they can’t hear my shrieks of laughter. The gansey is looking better every time I see a new photo. I had to laugh at myself yesterday as I went to look for a post from you, Gordon. Worse than Pavlov’s dog, (albeit one with “partialheimer’s. )Looking forward to your return, hope you are enjoying your break. Hi Tamar & Marilyn, and thanks for the good wishes. Yes, i’m having a very pleasant break—well, just a long weekend, really—doing nothing very much, but doing it rather well, as they say. It really looks wonderful. I love the red. And your drive sounds wonderful too. Here the weather hasn’t been able to make up its mind whether it’s going to be scorching hot or foggy and cold. Good luck with the gansey. If you need any encouragement or help, this board is a friendly sort of place to test the waters. Caithness has been pretty good this last week or so—the sun has shone most days, with just odd showers or cloud. But you can tell autumn is coming, the light is starting to slant diagonally, and the nights are drawing in. Soon be Christmas!